Easy Rider tells the story of two drug smuggling motorcyclists that ply their way across the country in search of their own personal redemption and find along the way a series of archetypal characters including redneck racists, burnt out idealists and disenfranchised individualists. The film's message and conclusion are open ended and thought provoking making this a story that can be visited over and over again with ever changing reactions. 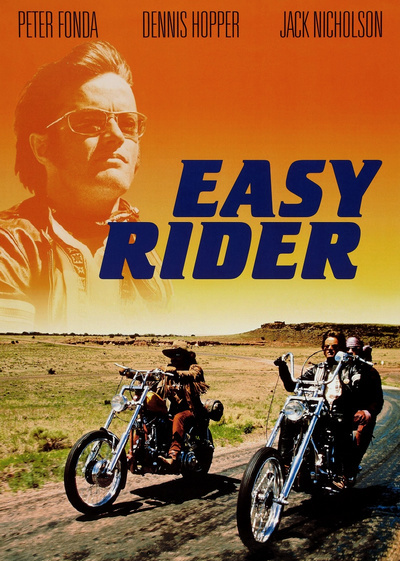 Easy Rider was one of the most important of the New Hollywood films, being the first independent film ever to be distributed by a major studio and possibly the first film to truly document America as it was in the 60s. The tale of two bikers crossing America was simple enough, but the real breakthrough was in the unusual style of the film, which initially had the studio utterly confused. Mostly shot freeform, many scenes were improvised and the footage was so shambolic that director Dennis Hopper took a year to edit it. • Commentaries - two commentaries, one with director Dennis Hopper, and another with actor Peter Fonda, production manager Paul Lewis, and director Dennis Hopper, which was recorded in 1995. • Born to be Wild - a wonderful documentary film by Nicholas Freand Jones, which was aired on BBC2 in December 1995. The film contains an abundance of raw footage and various interviews with Dennis Hopper, Karen Black, cinematographer Laszlo Kovacs, producer Peter Fonda, Henry Jaglom, etc. In English, not subtitled. (30 min). • "Easy Rider": Shaking the Cage - a documentary film directed by Charles Kisleyak in 1999, focusing on the enormous cultural importance of Easy Rider and its impact on American Cinema. With the participation of director Dennis Hopper, cinematographer Laszlo Kovacs, Seymor Cassel, Peter Fonda, etc. In English, not subtitled. (65 min). • Hopper and Fonda at Cannes - a segment from the French television from Pour le cinema, directed by Pierre Mignot, aired on May 22, 1969. In French, with optional English subtitles. (3 min). • Steve Blauner - a new interview with Steve Blauner, who discusses the BBS and its legacy. The interview was conducted exclusively for Criterion in 2010. In English, not subtitled. (19 min).